Image caption Who owns genes? A court in the US has again backed a biotech company's right to patent genes which have been isolated from the human body. Myriad Genetics has patents on the BRCA1 and BRCA2 genes, which are strongly linked to breast and ovarian cancer. Patents on genes have been repeatedly contested in the courts. The latest decision by the Federal Circuit Court of Appeals sided in favour of the company. 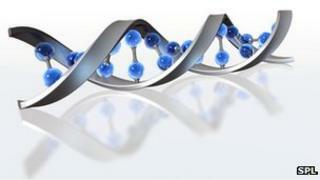 The patents are valuable as they give the owners exclusive rights to diagnostic tests for the genes. One of the questions in the case was whether isolating a gene makes it different to one still in the body. Circuit Judge Alan Lourie said: "Everything and everyone comes from nature, following its laws, but the compositions here are not natural products. "They are the products of man, albeit following, as all materials do, laws of nature." The decision was welcomed in a statement from the president of Myriad Genetics Peter Meldrum: "We are very pleased with the favourable decision the court rendered today which again confirmed that isolated DNA is patentable. "Importantly, the court agreed with Myriad that isolated DNA is a new chemical matter with important utilities which can only exist as the product of human ingenuity." However the American Civil Liberties Union, which contested the patents, argued: "Human DNA is a natural entity like air or water. It does not belong to any one company. "This ruling prevents doctors and scientists from exchanging their ideas and research freely."